As you may know, the original inspiration for Tiffany and I to start Scientific Adventures for Girls (SAFG) came from our own two young daughters – the desire to provide them with a fun space to develop a love of STEM – something neither of us had growing up. The idea solidified as we did more research on the need for high quality, accessible after school STEM classes, specifically for young girls in early elementary grades and even more so for young girls in economically marginalized areas. I attended a STEM Leadership Conference this October, hosted by the San Francisco Business Times, and there was resounding agreement from the 6-person panel - comprised of leaders in the STEM arena in the Bay Area - that STEM education should start in elementary school. To support this effort of introducing elementary children to STEM, numerous studies have found that the ideal place to help create and ignite a love of STEM concepts is in “out-of-school-time,” either after school or during the summer. SAFG also recognizes and agrees that out-of-school time is an ideal time to spark and encourage a sustained interest in STEM subjects in girls and reverse negative trends. Fun, hands-on, play-based STEM activities can engage students in deep, sustained study of STEM subjects that supplements what they are learning in school and promotes a lifelong joy of discovery. SAFG programming aims to step in before girls statistically begin to lose interest in science and address the reasons why girls tend to be less engaged in science and math in school even though they perform the same or better than boys in science and math. Studies have also found that consistent participation in out-of-school programs leads to a narrowing of the achievement gap between young people from low-income and high-income families (Christensen, R., Knezek, G., and Tyler-Wood, T. 2015). SAFG is proud to be a part of the growing efforts in the Bay Area to help create a more diverse and inclusive STEM environment and to change the face of science – starting with the 5 year-old building a beehive out of toilet paper rolls! 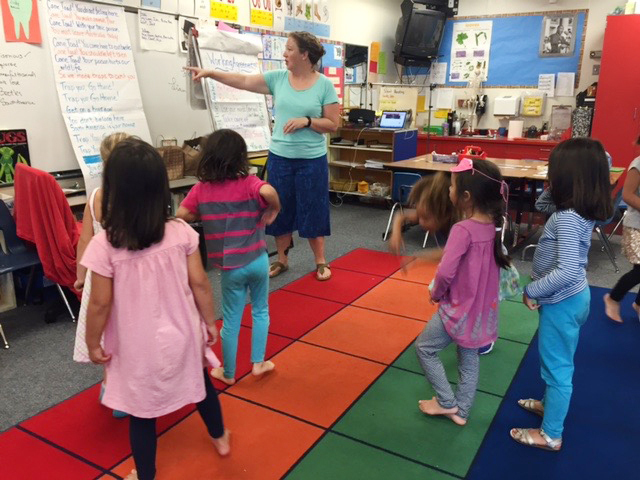 SAFG enjoyed a great fall session with classes at several sites throughout the East Bay. SAFG's philosophy includes not just pure science instruction and technical skill-building, but more holistic approach to learning. SAFG classes foster confidence-building, collaboration and fun! SAFG provides young girls the time and the space to have these rich experiences that they may not get elsewhere in their lives. SAFG teachers nurtured their classes and witnessed major growth over the last few months. Teacher Sonia Rawal facilitated 11 classes on Biomimicry this fall. Sonia watched the transformation of one of her students over the course of the class from a girl who, on the first day of class, cried and told her father she did not want to take the class – and literally begged him to take her home - to a girl who now is always the one with her hand up offering ideas and interesting thoughts that enrich the group discussions and who fills her lab notebook with complex diagrams and thoughts she has been inspired to include from her time in science class. She is a natural scientist, and thankfully she was given the space and the support to enter into the newness of the SAFG setting where she has not looked back since she settled into the group. It is also wonderful to see her parents involved in her STEM experience. One week her Dad brought the family chicken into class so the girls could meet a real live bird, and another week her Mom joined the class to help the girls explore various types of plant seeds. The 3rd - 5th grade group at the Anna Yates site has been a hotbed of collaboration this fall! Each session, led by teacher Rachel Anderson, has been an opportunity for girls of mixed ages to work together on designing open ended projects related to our biomimicry theme. Practicing effective communication and integrating multiple ideas and viewpoints into the final product are skills that are useful in science class and beyond! We have also benefitted from collaborations with our eighth grade student role model Inez, as well as our adult role models from UC Berkeley Flight Lab and Goldman Sachs . The opportunity to work with experts and see the variety of women who enjoy and engage in STEM careers can be a powerful means to visualize their own future as scientists. Be sure to stay tuned for information on how to check out our final projects that will be submitted to the KQED #engineerthat challenge! Teacher Ginny Delaney led a session on engineering humane traps for the invasive cane toads in Australia. In addition to the girls learning about how to design and build a trap, the lessons about invasive species was brought close to home here in the Bay Area as environmental scientists from the National Parks Conservancy and Golden Gate National Recreation Area visited the class to discuss the importance of native plants to our ecosystem. The K-2 group led by Ginny Delaney at Peralta learned how to design and build humane traps for the invasive cane toads. In addition, the girls learned the importance of making the public aware of issues of concern to the community through public service announcements. They came up with a song and dance to promote the safe removal of cane toads to the tune of the song YMCA by the Village People! 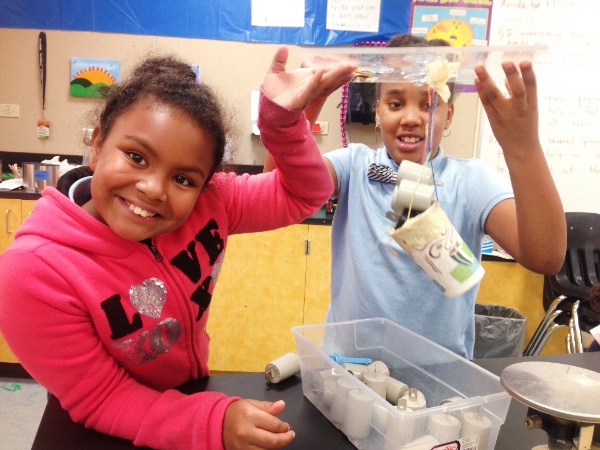 Teacher Deanna Gelosi led a unit on Biomimicry for a strong group of 2nd - 5th grade girls. There was one girl in particular who deserves some recognition. She was the only second grader in a class comprised otherwise entirely of fourth graders. However, her age and grade level did not hold her back from accomplishing great things after school. She is a leader in class which she demonstrates by taking charge on group projects and encouraging her teammates to keep up and work hard. During a building challenge where the girls designed bird wings, this young woman carefully assembled a giant wing inspired by those of a bat or dragon. Courageously she stepped onto the Lazy Susan to test out the bird wing for her group and we all celebrated when she was able to spin herself around. This young woman really embodied a fearless scientific mindset and inspired us all to do our best! An important component of SAFG programming is the presence of scientist role models in our classes. SAFG Role Models expose girls to living examples of strong work ethics and positive associations with science and math. This fall we were very fortunate to have four Near Peer Role Models Scarlet Nakadegawa-Lee, Ursa Kaiser, Inez Lumpkins and Tamara Aguilar. Near Peer Role Models are people who are "near" to the SAFG girls in age and experiences. Research has shown that exposure to near-peers is effective because the students can more closely relate to them and "see" themselves in their place. Scarlet, a sixth grader at Claremont Middle School in Oakland, mentored the 3rd - 5th grade class at Curiosity Hacked. Ursa, also a sixth grader, mentored the K-2nd grade class at Peralta Elementary. Inez, an 8th grader at Anna Yates Elementary, mentored the 3rd - 5th grade class at Anna Yates. Tamara, an 8th grader at Anna Yates Elementary, mentored the K-2nd grade class at Anna Yates. Similarly, SAFG invites female role models in science, technology, engineering and math careers to meet our classes to introduce the girls to new career opportunities as well as to show them the fun and relevance in science and math in the girls' everyday lives. We are grateful for Kris Klotzbach of Clif Bar; Niki Strudwick of Goldman Sachs; Sofia Chang and Leeann Louis of UC Berkeley's Animal Flight Lab; Mary Ables Ray of UC Santa Cruz; Mere Yeager of the National Cancer Institute; and Yakuta Poonawalla, Julia Fox and Alison Forrestel of the Golden Gate National Parks Conservancy for adding invaluable experiences for our girls this fall. 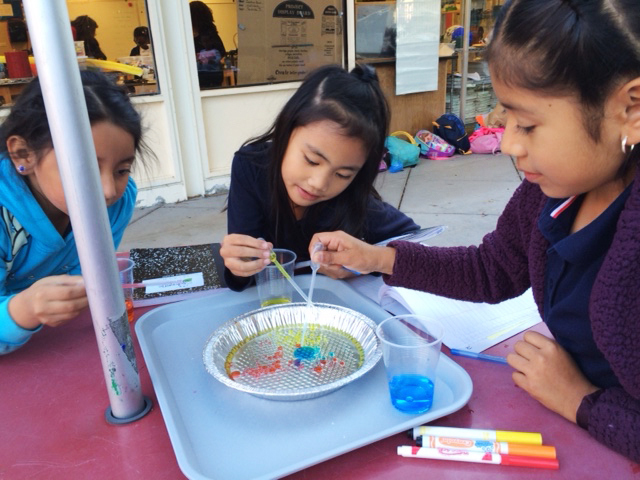 As it is "Giving Tuesday", SAFG would like to ask you to consider donating to support one of our STEM classes at a school serving disadvantaged girls in the East Bay. Any amount will help support the classes. Can we also ask that you pass this along to friends and colleagues who are interested in changing the face of science!! If you or someone you know would like to donate to SAFG, please go to our website. SAFG is very excited to announce it was just awarded two more small grants. Lockheed Martin is continuing to support SAFG's after school STEM class at Anna Yates for girls in 3-5th grades for the winter and spring of 2016. We also received a grant from American Eagle Outfitters to fund an after school STEM class at a new, under served school in Oakland for the winter/spring of 2016. More details to come as planning proceeds. If your company or foundation supports STEM education, we would love to apply to your corporate giving program. Please let us know. SAFG will be posting information on Winter program registration (January to March) on the website in early December. So stay tuned! In addition, SAFG will also start registration in January for its 2016 summer camps. Get into the winter mode with this chemistry experiment and make "snowballs" at home! Have your children unroll half of a roll of toilet paper and tear it into small pieces. Place the pieces in the bucket/dishpan. Cut the bar of Ivory soap into 6 or 8 smaller pieces, place on a microwave-safe plate and microwave for about 90 seconds. Make sure your kids are watching this step! Repeat until there are no big soap pieces. Allow the soap to cool completely before moving to the next step. Crumble the cooled soap into smaller pieces and add to the toilet paper. Pour half of the warm water over the toilet paper and soap. Get your hands in there and mix it up. If the mixture is too watery add some more toilet paper, if it’s too dry add some more water. You want it to get to a consistency where it’s easy to mold.When it’s time to clean up dump the bucket into the trash and use water to clean up. I highly suggest doing this outside in an area that is within reach of your garden hose. Courtesy of Home School Game School.